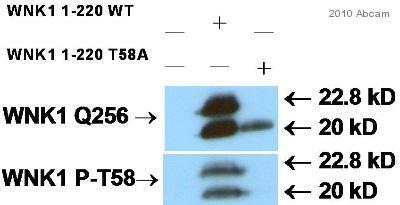 ab53137 detects endogenous levels of WNK1 only when phosphorylated at threonine 58. A synthetic phosphopeptide derived from human WNK1 around the phosphorylation site of threonine 58 (R-H-TP-M-D). 293 cell extracts treated with EGF (200ng/ml, 30mins) and human breast carcinoma tissue. 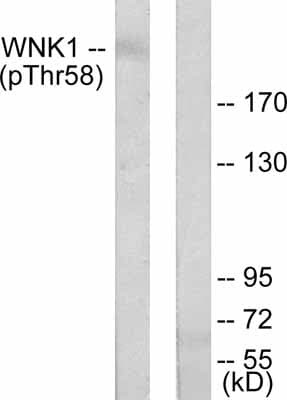 ab53137 was affinity-purified from rabbit antiserum by affinity-chromatography using epitope-specific phosphopeptide. The antibody against non-phosphopeptide was removed by chromatography using non-phosphopeptide corresponding to the phosphorylation site. Our Abpromise guarantee covers the use of ab53137 in the following tested applications. WB 1/300 - 1/1000. Detects a band of approximately 251 kDa (predicted molecular weight: 251 kDa). Serine/threonine kinase which plays an important role in the regulation of electrolyte homeostasis, cell signaling, survival, and proliferation. Acts as an activator and inhibitor of sodium-coupled chloride cotransporters and potassium-coupled chloride cotransporters respectively. Activates SCNN1A, SCNN1B, SCNN1D and SGK1. Controls sodium and chloride ion transport by inhibiting the activity of WNK4, by either phosphorylating the kinase or via an interaction between WNK4 and the autoinhibitory domain of WNK1. WNK4 regulates the activity of the thiazide-sensitive Na-Cl cotransporter, SLC12A3, by phosphorylation. WNK1 may also play a role in actin cytoskeletal reorganization. Phosphorylates NEDD4L. Acts as a scaffold to inhibit SLC4A4, SLC26A6 as well as CFTR activities and surface expression, recruits STK39 which mediates the inhibition. Widely expressed, with highest levels observed in the testis, heart, kidney and skeletal muscle. Isoform 3 is kidney-specific and specifically expressed in the distal convoluted tubule (DCT) and connecting tubule (CNT) of the nephron. Belongs to the protein kinase superfamily. Ser/Thr protein kinase family. WNK subfamily. Ubiquitinated in vitro by the BCR(KLHL3) complex and in vivo by a BCR(KLHL2) complex, leading to proteasomal degradation. ab53137 at 1/50 dilution staining WNK1 in human breast carcinoma by Immunohistochemistry, Paraffin embedded tissue, in the absence or presence of the immunising peptide. Publishing research using ab53137? Please let us know so that we can cite the reference in this datasheet.